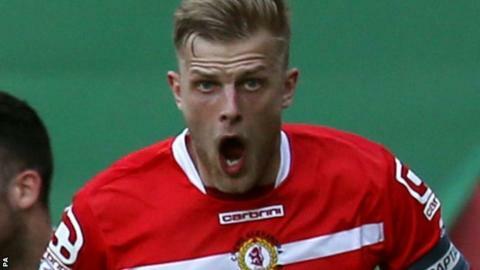 Crewe Alexandra boss Steve Davis has told BBC Stoke that his side can come back stronger next season following relegation back to League Two. Saturday's defeat by local rivals at Port Vale confirmed, with five League One games left, that Crewe will go down at the end of the season, four years after winning promotion under Davis. "I've said how difficult League Two is. It's not easy. It'll be hard," he said. "This wasn't part of the plan. But we have to deal with it and accept it." After two near misses on the final day of the last two seasons, this time Crewe's goose was cooked a lot earlier - with still a month of the season to go. And it made them, almost simultaneously with Bolton, the first club to be relegated in English professional football this season. "We've been clinging on for the last few seasons," Davis told BBC Stoke. "And we weren't able to make more of a fight of it this season as the previous two. "We're disappointed that we've not taken it to the death like we have before and over the course of the season we've not been able to win enough games. But I want this club to do better, to fight again next season. "We know that. We have to get over it quickly, rebuild and rediscover our form. I have to make sure I motivate the players enough to come back stronger." Is Steve Davis still on cue at Crewe? Steve Davis is English football's sixth longest-serving manager after four and a half years in charge at Gresty Road - and generally receives empathy within the game for the way he has to try to balance the books. In response to the question of whether he is still the right man, he told BBC Stoke: "I've always thought I'm the right person. When I got the job back then I thought I was the right person and nothing has changed. We've had four years in this league, but it still isn't good enough for me. I want better than that. "My job when I took over was to stay in the league, we ended up getting promoted and maybe we overachieved that season. "We've over-achieved the last two seasons and this season we haven't been able to over-achieve again because we haven't won enough games. "Being relegated is not a nice feeling. It hurts just as much as a manager as it did as a player. The young players will be feeling it. Hopefully, it will make them realise that they don't want to be in this situation again." Who's going down with the Alex? After next Saturday's home date with play-off outsiders Scunthorpe, their final four games are against sides in the relegation mix, with home games against Colchester United (23rd) and Doncaster Rovers (22nd), intermingled with visits to Oldham (18th) and Fleetwood (19th). And Davis promises there will be no let-up. "It's important in these final games that we restore some lost pride," he added. "We have to finish on a positive this season going in to next season where we want to be positive about coming straight back up. That's my aim, that's what I want and want the players to feel the same and have that ambition."